Honeybees and queen honeybees are acceptable for shipping within the continental U.S. and must be free of disease, as required under federal and state regulations. All other types of live, day–old poultry are nonmailable. Scorpions are mailable only when sent for the purposes of medical research use or the manufacture of antivenom. Scorpions are nonmailable under any other circumstances. Small, harmless, cold–blooded animals, except for snakes, turtles, and turtle eggs, are mailable only when they meet certain requirements. Warm-blooded animals, except for adult birds and specified day-old birds under specific conditions, are not mailable. This includes: cats, dogs, guinea pigs, hamsters, mice, rabbits, rats and squirrels. All snakes, turtles, and poisonous reptiles are nonmailable. 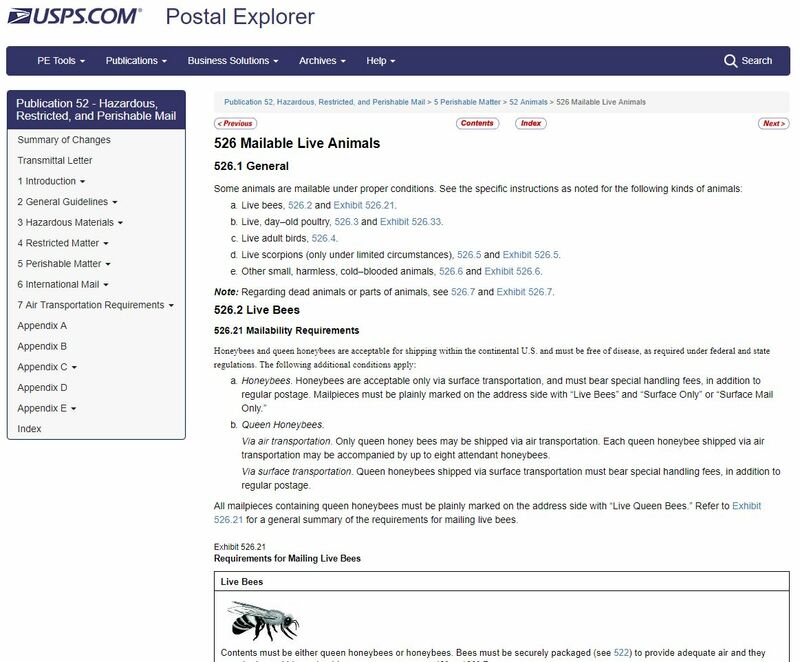 All poisonous insects and all spiders, except scorpions under limited circumstances, are nonmailable. Other nonpoisonous and non-disease-conveying insects are permitted. We know a lot of factual information about the starling—its size and voice, where it lives, how it breeds and migrates—but what remains a mystery is how it flies in murmurations, or flocks, without colliding. This short film by Jan van IJken was shot in the Netherlands, and it captures the birds gathering at dusk, just about to start their “performance.” Listen well and you’ll be able to hear how this beautiful phenomenon got its name. I can’t decide if this gif from I created sneltopia video of a snail eating lettuce is cool or gross. Either way, it’s fascinating. To process food before it enters the esophagus, snails use a radula to crush it. This is a ribbon of flesh with very fine teeth which grinds the food like a very fine cheese grater. This territorial struggle between two octopuses (octopi, octopodes) is a thrill to watch. The tentacle free-for-all and color changing turmoil from the sea provides for an exciting couple of minutes. The ambushes an guerrilla style aggression exhibit the undeniable intelligence of our cephalopod friends. Well it looks like my prediction was wrong. Last night, just before midnight, the Gävle Goat went down in flames. Much like last year’s video, I scraped a live webcam of the blaze and set it to some holiday music for your viewing enjoyment/horror. NYMag has a great interview with Eje Berglund, the representative and chairman of the committee that oversees the Gävle Goat.